Update 26.5 : Modified estimator in next post to also show individual variables and their weights. Disclaimer: This was done as a toy experiment, and as such has mistakes/parts that could use more experiments. Also Wikipedia links are used just to give you quick way to check whatever those things are. thankfully PsyOps research shared their BF3 player dataset. Only 22 of the provided variables were used (you can find them in the picture). As a result the system was able to classify soldiers correctly 85% of the time with both training and testing set (no overlapping samples). as 0 and console as 1, thus positive weights contribute to being on console platform. Note again that all these variables were divided by gameplay time. Lots of dependent variables. Eg. shots, hits and suppression are all related to shots fired, vehicleskills - vehicledestroys - vehicletime are dependant and so on. You must also input your soldier's platform to fetch correct info from bf4stats. However this information is not used in calculations. I'll bite, since I refresh BF4Stats daily in order to get accurate individual weapon accuracy stats, which is not something you can get from Battlelog Reports. I play to what I consider to be my primary weapons' strengths, so I'm never first on the objective (and thus sometimes miss out on vital Flag Capture points as I get onto the flag too late), thus the low-ish SPM. KPM is also low due to the high TTK of my chosen weapon playstyle. I definitely get way more Repairs than Revives / Heals / Resupplies because I stay away from Locker / Metro. Weapon accuracy are creeping up thanks to the new monitor as endorsed by Miffyli, but is a bit too late to affect the overall stats too much due to sample size. Also by running Suppressor but staying in mid-long range (50m+) accuracy will suffer. Headshot to Kill ratio (and overall headshot % in general) is low, because DMR damage model is so consistent (plant 3 hits from "top of the head to tip of the toe," as the manager of my local paintball field likes to say in his orientation speech) that I don't make a conscious effort to aim for the head. My headshots are usually just due to having nothing else to shoot at, or recoil-induced accidents. 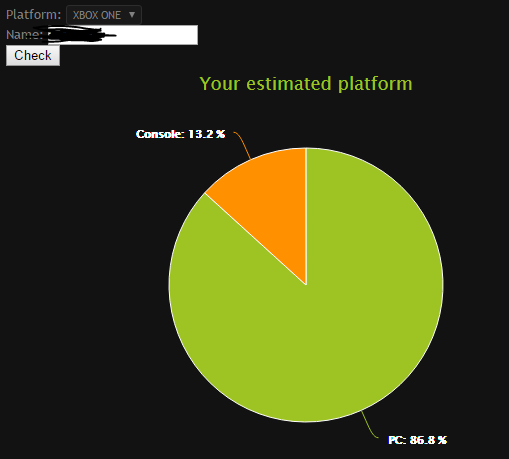 That adds up to ~60% Console you see above. Yeah that's pretty much how this works. There are other components too to the calculation but as far as I understood from sklearn LDA source code shown weights are the biggest part. I figure the system could be way more accurate using other variables and something more sophisticated, but where is the fun in getting 100% vs. 0% always? Btw I might add another chart too that shows per-variable weight for given soldier, so you can see what aspects move you towards consoles or PC. Though, your "PC-ness Score" might be slightly skewed by the folks who LIVE on Locker and thus have 50k kills and 30% accuracy with their AEK Comp + Stubby + Coyote because they don't need to shoot at anyone further than 10m. Not to mention high Headshot % due to everyone is head-glitching. True, but also at the same time number of kills (lots?) would move them towards console end, same with suppression (I would assume, don't know for the fact). But yeah, without more priori knowledge (eg. knowing how many console players play locker) it's hard to say. However if all game-mode/map distributions were same among console and pc players, this shouldn't reflect and get skewed by those. And ofc "they being mainstream" can be the case . Again, can't know if many of these players were locker-grinders. At the very least, these averages are skewed to more experienced player side due to the bias in dataset. All of use play mostly conquest. All of us have about equal accuracy. One of us NEVER plays medic, and neither of us play much support. 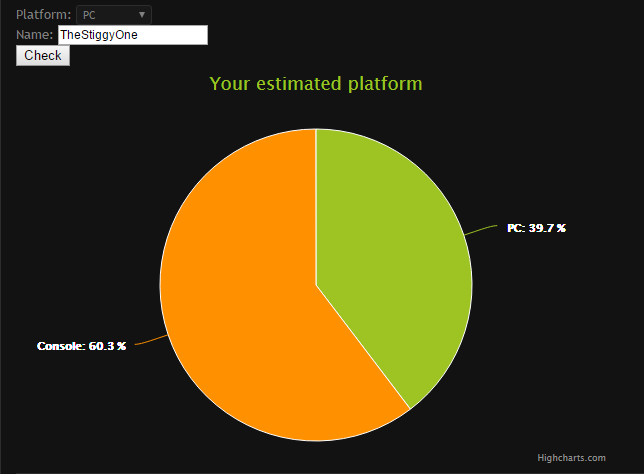 The one never playing medic had the most "console" score (61%, opposed to us others who had 13% to 8%). He also plays the most engineer (so he also reps). The one of us three occasional medics who plays the most support had the most "PC" score. Miff, i have to remember you though, that bf3 on console had no more than 24 player servers.